One of my earliest memories is of a warm day, a field with many grasshoppers, a shallow creek with cold water, and the joy of a day in the hills with my parents. My dad had gone fishing and I was free to wander about nearby. It was summer in the Gray Pines foothills of the Sierra Nevada, near Chico, California, where I was born. Along the creek I found a turtle! I had hoped someday to have one as a pet. I ran with the wondrous creature cradled in my hands to show my mom. I was enthralled with its bright eyes, the feel of its claws, and its cold body as it struggled to free itself from my grasp. So began a lifetime of connecting with nature. •	a captivating array of activities to capture the attention of students of all ages: imitating animal sounds, quieting lizards, tracking animals, photographing birds, and playing hide and seek with owl calls. Even a quick glance through Connecting With Nature will make you wish you could give your students the joy of a day in the hills with the author. Failing that, you can use his book to instill a love of nature in your students—and rekindle it in yourself. The book’s target audience is anyone working with children from 4 to 18 years. 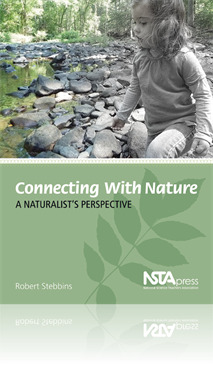 The author provides advice for setting up a sound, nature-centred educational programme, enabling educators to help their students to learn about nature at first hand and to come to a better understanding of how natural ecosystems work, regardless of their size. There is a wide range of topics covered for teachers to share with their students, including the development of ecological literacy and environmental concerns. There is guidance on how to carry out accurate observations through drawing and note taking, make field reports, imitate animal sounds, track animals, create a school garden, photograph birds and play hide and seek with owl calls. These activities are supported by examples and anecdotes, with his perspective on the importance of dealing objectively yet compassionately with social and environmental problems.